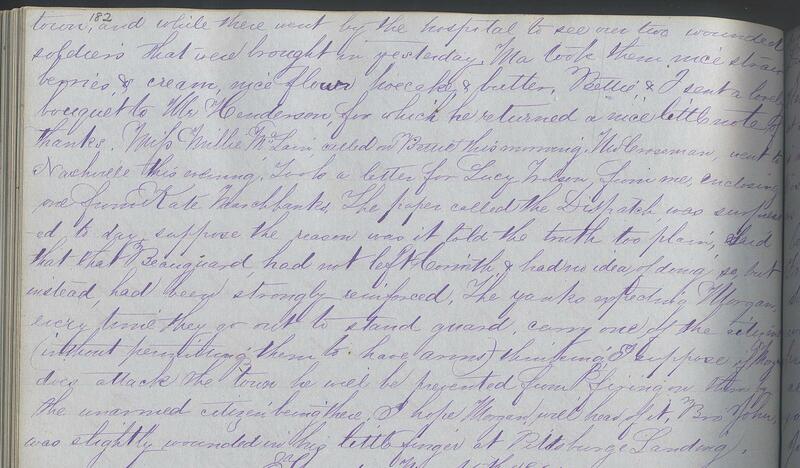 Item description: Diary entry, 14 May 1862, describing the Union occupation of Murfreesboro, Tenn., the alleged censorship of a newspaper, care given to two wounded Confederate soldiers, and other news. Catherine “Kate” Carney (1842-1930) was the daughter of Legrand Carney and Katherine Wells Lytle Carney. Her father Legrand was a successful merchant and landowner in Murfreesboro, Tennessee. Carney’s diary (chiefy 1859-1862) describes antebellum life in Murfreesboro, Tenn.; travel in the Southeast, Northeast, Midwest, and Canada; schooling in Philadelphia; a stay with her sister in Yazoo County, Miss. ; and life in Murfreesboro during the Civil War while the city was under U.S. army occupation. It was a pretty morning until about one o’clock, when all of a sudden it looked as if we were going to have a terrible storm, but it contented itself with a nice little shower and stopped. Ma & Cousin Ann went up town, and while there went by the hospital to see our two wounded soldiers that were brought in yesterday. Ma took them nice strawberries & cream, nice flour hoecakes & butter. Bettie & I sent a lovely bouquet to Mr. Henderson, for which he returned a nice little note of thanks. Miss Millie McLain called on Bettie this morning. Mr. Crossman went to Nashville this evening. Took a letter for Lucy Wilson from me, enclosing one from Kate Marchbanks. The paper called the Dispatch was surpressed today, suppose the reason was it told the truth too plain. Said that Beauregard had not left Corinth, & had no idea of doing so, but instead had been strongly reinforced. The Yanks expecting Morgan every time they go out to stand guard, carry one of the citizen’s (without permitting them to have arms) thinking, I suppose, if Morgan does attack the town he will be prevented from firing on them by the unarmed citizen being there. I hope Morgan will hear of it. Bro. John was slightly wounded in his little finger at Pittsburgh Landing. This entry was posted in Southern Historical Collection and tagged censorship, Kate Carney, Murfreesboro, occupation, Tennessee, wounded soldiers. Bookmark the permalink.